Indentification of this design as number 133 is original to Rakusan who designated this woodblock print as the 133rd design published in his main sequence. However, 133 is actually the thirty-third of thirty-six woodblock prints in Rakusan's second main sequence series, 篁子生画選, Koushisei Gasen, lit. 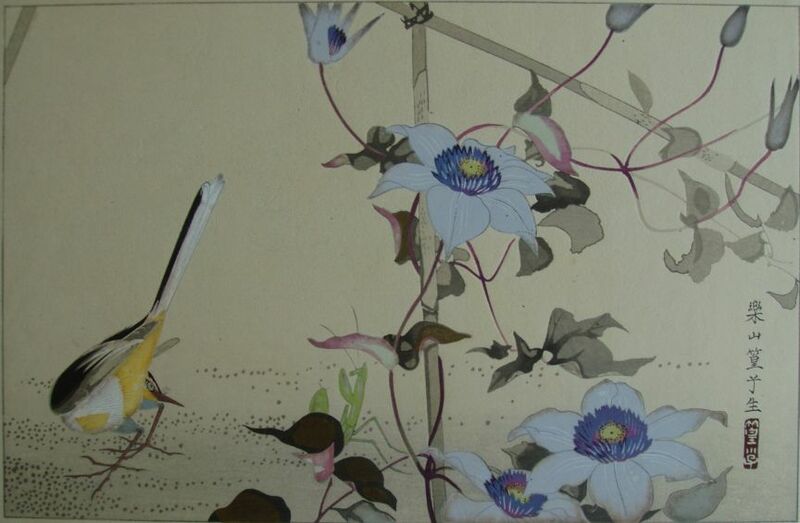 'Koushisei's Print Selection' (usually called here the 36 Series). The woodblock print of 133 was adapted from an actual-size original painting on silk. All of the original prototype paintings for this series are currently in a single private collection. Like most 36 Series designs 133 has the same signature and seal combination on every copy. Therefore, for 133 only a single extended edition I (which includes reprintings both before and after World War II) can be distinguished. It is usually only possible to date an individual loose print of 133 with edition I markings by listing approximate potential ranges of 1935-1941 and 1948-1955. The copy illustrated above is typical of edition I. The Rakusan project which produced 篁子生画選, Koushisei Gasen, resulted in two related series of woodblock prints. Each print of the 36 Series is intimately connected to a group of prints with the same subjects in the Fan Series. Together these subject-related prints in the two series constitute a theme. Each theme typically consists of a quintet of monochrome Fan Series designs (one design in each of the five fan shapes), plus one polychrome, 36 Series design which illustrates the theme subject. The theme is labeled here by the original Rakusan number of its 36 Series design followed by the subject. 133 is the 36 Series design of the 133 Clematis theme. The 133 Clematis theme is one of the many entirely regular themes represented by a complete fan quintet and a color woodblock print.133 and two of the five Fan Series designs have seal C which indicates carving dates between the last months of 1933 and the end of the first quarter of 1934. However, the remaining three Fan Series designs have seal B which indicates a later carving period closer to the time of publication. The 133 Clematis theme was eventually grouped with other summer season themes near the end of the series. Rakusan deliberately repositioned 133 immediately after 132 with which it shares its historical development (see below). The Fan Series prints of the 133 Clematis theme were distributed in early 1935 in installment eleven (of twelve), but the delivery documents for installment eleven remain to be discovered. The series as originally announced would have seen this installment published in November 1934. However, with documented delays the earliest month it could actually have been delivered is February 1935, and it may well have been even further delayed. In the 133 Clematis theme, three of the five Fan Series designs are taken directly from TBS, and the other two are original designs which are only partially in the TBS style. The 36 Series design 133 is also taken in part from TBS, but has been adapted in Rakusan's own style. 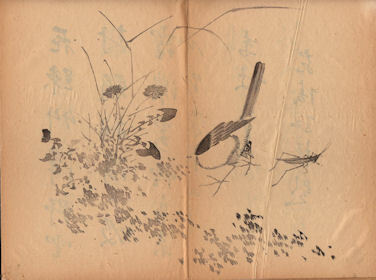 The pose of the bird and its interest in a large insect are from TBS, but Rakusan made the bird more realistic and identifiable and he substituted a larger and more dynamically posed insect. The use of a bamboo trellis for the vine indicates a garden setting. Gray Wagtail, Motacilla cinerea, 黄鶺鴒, きせきれい, キセキレイ, ki-sekirei, lit. 'yellow wagtail' is a common Japanese native. Narrow-winged Mantis, Tenodera angustipennis is a Japanese native insect which has many common names, of which 蟷螂, 螳螂, 鎌切, かまきり, カマキリ, kamakiri, is perhaps most recognizable.